With the new Internorm extension, you can easily integrate I-tec ventilation and I-tec shading Internorm controls into a Loxone Smart Home. Working seamlessly together, the Miniserver can take care of operating the Internorm elements in your home so that your home does a much better job of harnessing nature to meet its ventilation, heating and cooling needs. A Loxone smart home knows what you need. It knows when I-tec ventilation and I-tec shading need to be activated based on the date, time, location, and sunrise and sunset times. With additional sensors, your Internorm devices can be fully automated in your Loxone Smart Home. Fresh air is extremely important, not only for our own health but without regular fresh air we run the risk of mold or moisture build-up causing damage to the building itself. The more you are in a specific room, the more frequent the ventilation in that room will be. Choose what time of day the vents in the room are opened and closed. The ventilation can be activated when the humidity goes above a certain point. Likewise, when it’s too humid or hot outside, the vents will close to make the aircon more efficient. The ventilation can kick in to make sure that CO2 levels are never at a dangerous level. 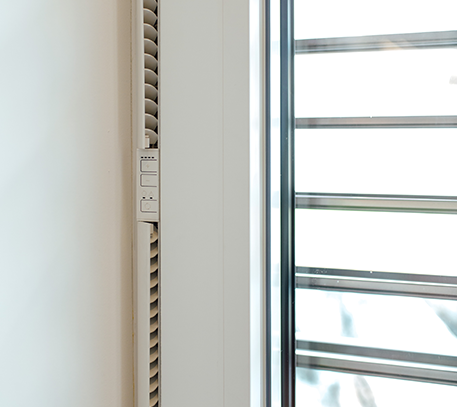 Control individual room temperatures with a decentralised ventilation system. You can take control of the ventilation at the touch of a button or from your smartphone and tablet. By integrating Internorm I-tec shading in your Loxone Smart Home, you can experience maximum comfort and safety, as well as optimal energy use. The shading can be fully automated using sensors, weather data and the time of day. Your blinds can respond to the irradiation and the location of the sun. The autopilot will close the blinds in the evening to give you privacy. Reach the desired temperature by having your blinds blocking out the sun when it’s too hot, or allowing the sun in to bring warmth. A Loxone Smart Home can still allow natural light into your home without allowing in the heat from the sun. The blinds close to help give you a comfortable night’s sleep. The blinds then open to let the morning sunshine in to gently wake you. The Internorm extension hands over control to the most intelligent part of your home; the Miniserver. By centralising the control of the Internorm features in your home, the information generated by these can be used in conjunction with PV and other complex systems.